2015 is turning out to be a memorable beekeeping year. There’s been late night mishaps with cops and several angry dog incidents, but I must remember it’s not over yet! 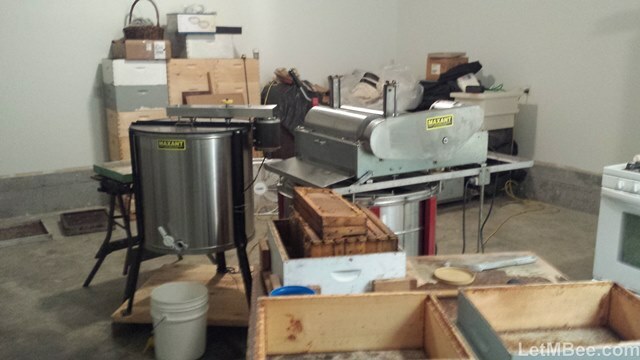 I have always invited some close friends to honey extraction ever since I started keeping bees. It’s a good time for me to visit with people because it’s one of the few times of year I am in a fixed location long enough to have a conversation. This year I said something to several people about extraction Sunday, but everybody was busy this year. Over time I had asked more and more people over, but thought it was just gonna be my father-in-law and a potential co-worker “maybe”. – “Our plans fell through, we’ll be there at 2… we’ll bring some appetizers and wine”. When this started happening I knew I had better relay the message to Holly ASAP, “We’re just about to have a bunch of people over……” It is a good we keep some mead around. We didn’t know it yet but we were getting ready to experience an impromptu BASH! The festive nature was good to take my mind off how LITTLE honey I collected in 2015. This year turned out to be a lackluster production year for ME at least. It was the first year I experienced rain right at HALF the days in June. After the rainy-period it appears that most of my colonies as well as many of the feral colonies swarmed. I have discussed this with other beekeepers and learned of some techniques that MAY have helped me get more honey, but they were not implemented in time this year. The next time I am faced with a weather oddity like that I will do some experimenting. Supers had been gathered on 9/17/15. This year there were only 6 honey production colonies at four different yards. SIX YOU SAY!!! Yeah… To bring you up to speed over the last couple years we added a new family member, bought a farm, did some major improvements and built a house, not exactly in that order, but close. Beekeeping slid a little bit cause it had to, just as it does for any other beekeeper from time to time. Initially I was pretty disgusted after super retrieval. But after thinking on it a while, the glass is way more than half-full. I still have SIX unfed/untreated honey-production colonies that look good going into winter. Resiliency is the result of a TREATMENT-FREE / FEED-FREE beekeeping program. When life gets hectic your beekeeping life won’t end on you. This has me thinking that some of the metrics for beekeeping success might need to be evaluated. If you make the metric for success UN-achievable beekeeping WILL NOT be fun. What should we call success or failure in hobbyist/sustainable/homestead beekeeping operations? 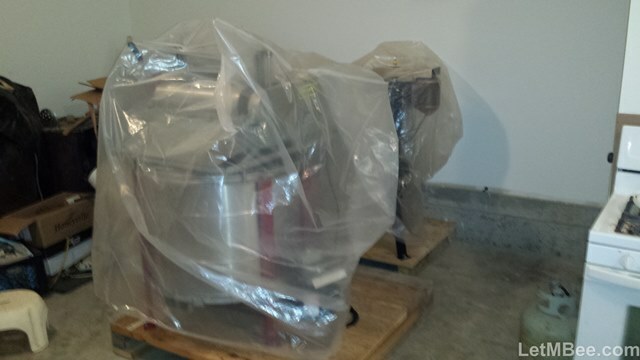 This was the first year for the new Maxant 1400PL AND for extraction in my own garage. Everything was configured to minimize mess and made for a simple operation. Remove frames from supers, place in chain un-capper, then to the extractor, from there into an empty box. This did away with the use of an uncapping tank all together. It was the first time without one so it felt weird, but only for a while. It actually seemed simpler without it and most importantly it’s ONE LESS THING-TO-BE-CLEANED! There were no real mishaps once the extractor’s pallet was shimmed. I have a floor drain in the center of my garage. The floor tapers to it from all the walls creating four very small valleys. Each valley goes from a corner of the garage to a corner of the drain. Due to this the floor is not perfectly flat where the extractor was sitting. I had some thin shim like material, but no actual shims. They are on the list of things to buy before the next extraction party. Once the extractor stopped wobbling things pretty much followed my usual program. 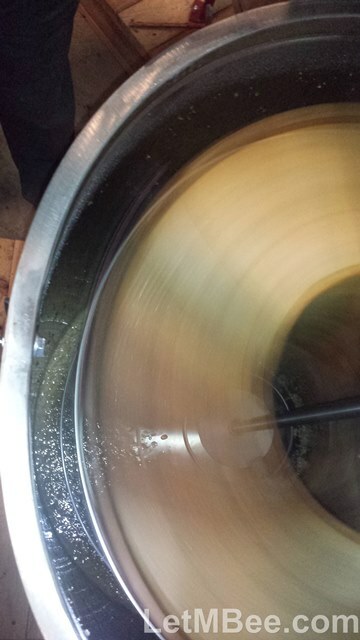 The frames that had greater than 80% capped honey were extracted first. Any frame with <80% capped honey was sorted and held to the side. Once all of the salable honey was extracted the uncured nectar-frames were extracted for mead making. The party was over and people began to leave just in time for cleanup. Luckily the floor drain made things a lot easier. First the extractor and the capping-spinner had been tipped up so that any reaming honey ran out more quickly. Then both pieces of equipment were positioned over the drain. In order to keep wax from clogging things up, a bucket with the bottom cut out of it was placed over the drain. 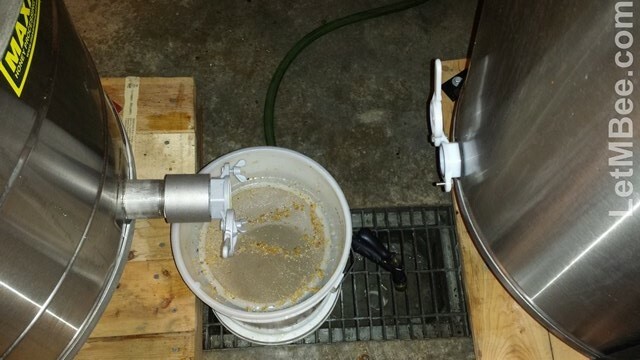 A 600micron filter was placed on top of a bucket and the inside surfaces of the uncapper/capping spinner and extractor were washed down with the hose. I know a lot of people feed honey-covered cappings back to their bees, but the spinner does a pretty good job of getting them dry. I didn’t have much to mess with and wanted to test washing them out inside the spinner. It made for nice clean cappings that were ready to be melted down. 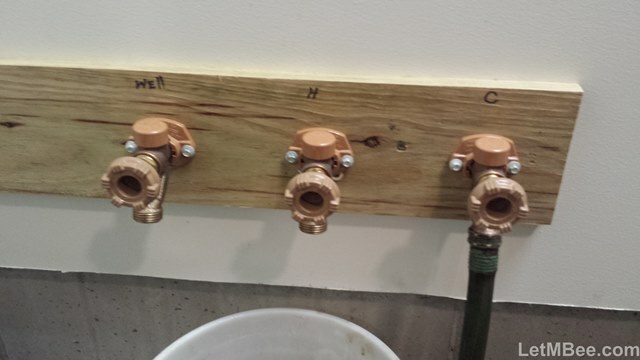 There are faucets for Well, Hot Cistern, and Cold Cistern water in the garage. Everything was initially washed down with COLD WELL WATER to get most of the wax out, THEN HOT Cistern water to make sure that any honey residue was removed. Finally everything was washed down with COLD cistern water to push the rest of the HOT water through the hose, remove any residual wax, and reduce the chance of water spotting on the dried equipment. After everything drip-dried for while all surfaces were wiped down with a towel and the machines were greased in the appropriate locations. Both were then covered in plastic for storage until next Spring. Even for being the first time things went amazingly well with cleanup. I was able to do everything myself in about 4 hours which is a huge improvement over previous years. Having an indoor water source and floor drain allowed me to complete this task AWAY from bees, yellow jackets, and wasps which is always nice. Also I didn’t start any robbing frenzies at my home apiary. 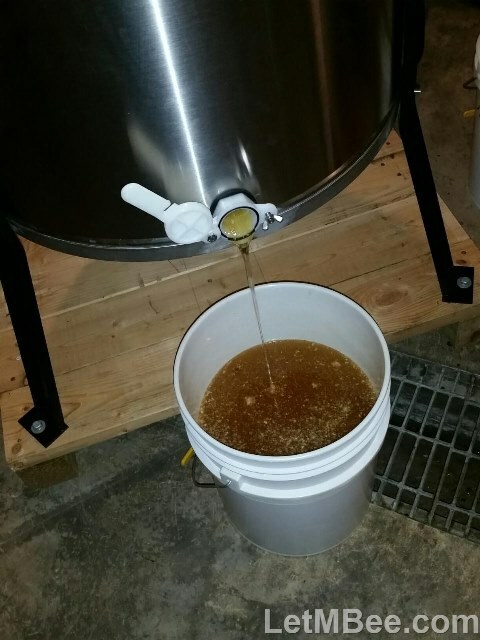 How was your honey crop? Hope it was better than mine. 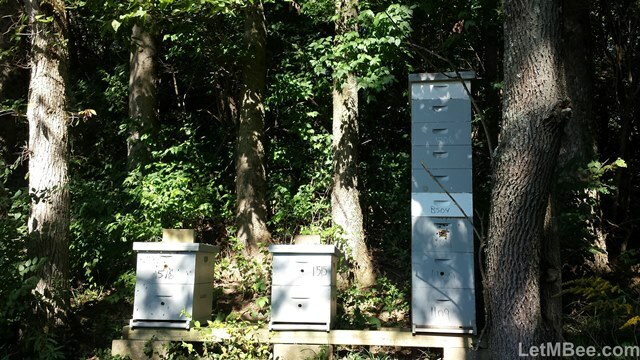 This entry was posted in Honey, Posts and tagged feral bees, honey, honey extraction, Indiana Beekeeping. Bookmark the permalink.